The most crucial tasks during drilling are keeping within lease lines and hitting the target zone. This involves utilizing directional and logging sensors to ensure the drill string is at the proper depth, angle, and formation. 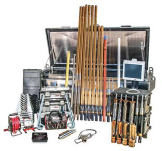 Operators rely on precise, proven technology in order to eliminate costly mistakes or trips out of the hole. 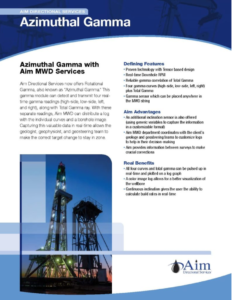 Aim Directional Services’ Measurement While Drilling (MWD) technology allows operators to stay on target and land in zone without worry. Using industry‐proven, robust, highly accurate sensors; Aim supplies directional and gamma ray logging for any application. 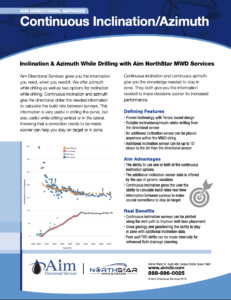 This information is sent up in real‐time utilizing efficient and reliable mud pulse and electromagnetic (EM) telemetry options to fit any drilling need. 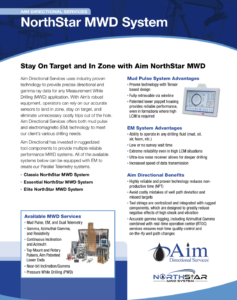 Obtain necessary data on‐the‐fly without costly maintenance trips with Aim Directional Services’ MWD.